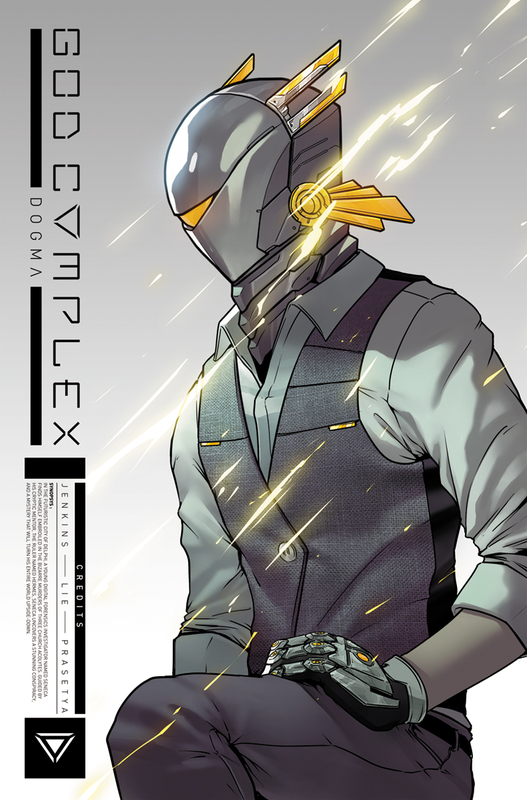 Inspired by a high-end toy line from GLITCH and Bryan Lie, God Complex #1 introduces us to the cyberpunk city of Delphi, the digital gods that rule it, and a triple murder that begins to expose a conspiracy. Seneca is a promising young detective who's guided by a voice in his head. It could be his conscience but seems independent. He works with one of the digital gods whose bodies are human but wear helmets like Daft Punk and can tap into the digital spectrum. After three acolytes of the church are found dead and with little evidence to go on, Seneca doesn't see the investigation going anywhere but that soon changes with help from Hermes. It opens up new wounds from his former association with the church and the answers may lie in having to face the church once again. Paul Jenkins is the veteran writer tasked with bringing this convoluted and complicated world to life. It's fully formed and Jenkins is asking readers to jump on board a freight train barrelling down the track at full speed. It might take repeated readings to fully grasp the scope of the plot and the motivations of the characters. Seneca appears sullen and exhausted but fascinated by the gods who have taken a liking to him and his performance. 'God Complex' is full of ideas that still need to be fleshed out to give significance to what we see in issue one. It's world-building on-the-fly as we try to gauge the stakes and learn about this futuristic environment. Its greatest concept is these mythological gods that wield the power of information and reign over the citizenry. And the layouts and designs from artist Hendry Prasetya are stunning. The detailed backgrounds and character designs make this cyberpunk future world recognizable from similar stories but the execution is nearly flawless. Prasetya shines brightest when Hermes taps into the digital landscape and conveys it with streaks of digital lines intertwined with objects coming straight at him and Seneca. The attention to detail is impressive in the wardrobe of the gods, with tailored suits, revealing every line and texture. Jessica Khollinne could have kept the dreary appearance the opening scene implies of this world but she adds splashes of color and uses it to cut the darkness in interesting ways. She adds elements that electrify the page. 'God Complex' #1 is off to an interesting start. It has a distinctive voice and knows where it's going. Jenkins certainly doesn't hold your hand, you just have to get in, buckle up, and hang on. This is not for the uninitiated. This is going to take at least 2-3 issues to fully grasp what the hell is going on and to decide whether or not you want to stick around. There's a lot to like, art being one of them and a mysterious conspiracy that's ready to boil over.